OKIS: What our research found! Our research report has been peer reviewed, edited and published by our funders the NIHR HTA programme, so we can now share our findings with you. This blog is to give you a flavour of what we did, what we found and our recommendations going forward. Links to the full report and a variety of summaries catering for every level of interest are provided at the end. What were the views of users of orthotic devices? We talked directly to users of orthoses for knee instability resulting from a neuromuscular disease (NMD) or central nervous system (CNS) condition. We wanted to know what makes a device acceptable, how much they used their devices and what influences use. In-depth interviews with a diverse range of users revealed that orthotic devices are vital for users to live as normal a life as possible, engage in daily activities and have independence for as long as possible. Malfunctions of a device can therefore have serious consequences for the wearer. To ensure devices are used and not left lying in cupboards, they need to be effective, reliable, comfortable and durable. Many of those interviewed were frustrated with what they saw as deficiencies in service provision relating to appointment and administrative systems and referral pathways. It’s important for us as researchers to make sure that when we carry out research into whether something works, that what we take as an indication of success or failure (the outcome) can be measured, but also is relevant and important to patients. In our interviews with users of orthotics we got consistent feedback that a reduction in pain, falls or trips, with improved balance and stability were of primary importance. These outcomes tended not to be measured in the research we found assessing the effectiveness of devices. They were also only seen to a limited extent in the responses from health professionals to our survey of practice. We recommend that future research should include more qualitative studies to build on our work, and investigate in further depth some of the issues raised in our interviews with users of orthotic devices. What did we learn from the healthcare professionals? Orthotists, physiotherapists and rehabilitation medicine physicians were among the 238 healthcare professionals who responded to our on-line survey. They told us they prescribe a range of orthoses for knee instability related to NMD or CNS conditions. These included knee-ankle-foot orthoses (KAFOs) ankle-foot-orthoses (AFOs) and knee braces; with shoe adaptations and insoles also prescribed by many. About half the devices prescribed or fitted were reported to be custom-made. The majority of healthcare professionals thought comfort and confidence in mobility were extremely important outcomes from treatment, matching in part the priorities for patients. When it came to outcomes for assessing the effectiveness of the devices provided, about a quarter of the health professionals said that no formal outcome measure was used. No single outcome measure was used by the rest and only a third said they formally assessed patient satisfaction. The good news is that having identified this gap in service delivery, our interview work with users of orthotic devices can help provide an understanding of what a core set of patient reported outcome measures in the clinical setting should look like. We recommend development of a core outcome measure set, and that reduction in pain, falls and trips, improved balance and stability as well as participation in paid employment, outdoor activities (such as gardening), family visits and social events should be considered. This should ensure a more patient relevant assessment of the impact of any change in device or management strategy on individual patients. 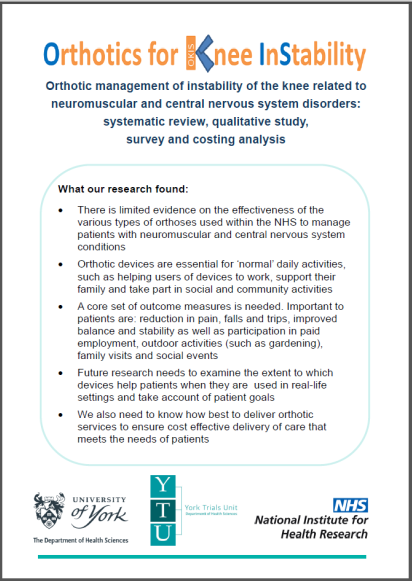 We also suggest that future research should explore different models of delivery of orthotic service for people with NMD and CNS conditions to identify best practice in terms of greatest benefit to patients and value for money. What does the existing evidence tell us? We took a systematic look at the existing evidence to assess how well the various orthotic options for knee instability actually help patients in every-day life. Unfortunately the few studies we found had small numbers of participants, were generally poorly reported and all were at risk of bias, meaning the findings cannot be relied upon. Disappointingly, we also found that the studies we did identify, assessed mostly mechanical outcomes such as gait analysis and energy consumption. While these are important aspects of assessing a device, they were not supplemented by assessment of outcomes important to patients such as daily activities. Given all of this, it wouldn’t be right for us to draw any specific conclusions about individual devices. What we have been able to do is make specific recommendations for future research in this area. Research on the effectiveness of devices for knee instability in NMD and CNS conditions is needed using outcome measures relevant to patients’ everyday lives. Given the challenges we have identified in our work, future trials should start with a feasibility study. Because of the relative rarity of some NMD and CNS conditions and the personalised nature of the orthotic device or devices needed, a national registry may be a more useful approach than trials. The full report is 296 pages long and obviously includes full details of the background, methods, results and implications. A plain English summary provides an overview in lay language in just 249 words; or there is a scientific summary in 2,730 words. Did our engagement strategy work? The aim of this blogsite was to provide us (the research team) with a way of engaging with people who might be interested in our research project from the start. It will also play a major role in helping us disseminate the final results: but we have a bit to go yet. The main ‘output’ of our work will be an NIHR HTA report. This report contains details of everything we have done, including the methods, the results and our conclusions from the systematic review, the patient interviews and the survey of health professionals. We then take an overall view of the results and interpret what we have found in a concluding discussion section and consider what the implications might be for clinical practice and for further research. The report than has a considerable journey of its own: the draft we have just finished has gone out to our Advisory group members for their comments and suggestions. We then address any issues they raise, before submitting the report to our funders, NIHR HTA programme. They have a team of editors who check the report and send it out to some external, independent experts for peer review. This means every aspect of the report will be examined to ensure that we have done everything we agreed to do when granted the funding, that we presented our methods and results clearly and precisely, and that our discussion and implications sections are appropriate and supported by the work we have done. The comments of the peer reviewers will be sent to us and addressed before the report is finally returned to NIHR HTA programme to be published in the NIHR Journals Library. While the report is out for peer review, we will be working on other dissemination outputs. This includes drafting a summary report, a number of blog posts and some academic journal papers. Once the peer comments have been addressed and any necessary changes also made to these other outputs, we will be able to make the findings available. All these other formats will aim to present the essence of the full report in brief and in lay language so everyone understands the findings and implications. Thanks for your patience, be assured that we will make sure you get to know the findings as soon as possible – just watch this space! We are now at the stage of reviewing the evidence and information collected in the various elements of this project and starting to interpret the findings. To assist in this process we are tapping into health professional and research methods expertise from the project Advisory Group. At our third Advisory Group meeting the research team gave an update on each of the elements of this project. The systematic review has been completed and the discussion and recommendations sections are being compiled. The survey of health professionals has closed and the responses collated for analysis. The third element, the qualitative study of patients’ perspectives is almost complete with just a few more interviews to be held. In the meantime we have started coding and the data emerging are looking very informative in relation to the questions we set out to answer. Meeting with the Advisory Group was a chance for the research team to ask the health professionals for their thoughts and advice. For example there was a discussion about how often patients are reviewed to assess how they are managing with an orthotic, a question in the healthcare professional survey. The Advisory Group suggested comparing this information with BAPO guidance on frequency of patient review. Some of the survey respondents dealt with in-patient groups and after discussion with the Advisory Group we will try to separate out the in-patient and out-patient results. The next stage now is to complete the analysis of the qualitative study and write the full report for submission to our funders, the NIHR HTA programme. Once they received the report they will check it and send it out to external peer review. We will be asked to address any comments from the peer reviewers and then the report will be published in the NIHR journal library. We will also be disseminating the findings in a variety of other ways – which we will tell you about in another blog. Survey of health professionals: analysis begins. Our survey of health professionals is now closed and we are starting on the analysis of the data collected in the online questionnaire. This will involve a relatively straightforward descriptions of the data collected for presentation in the final report. For example, we will look at how many members of the different health professions filled in our questionnaire; how many of them see patients with neuromuscular diseases such as polio; what the different ways of working, are such as working in stand-alone clinics or as part of a multidisciplinary facility. This may sound a bit basic, but currently this information is unknown. We hope to provide a much better picture of what and how orthotic services are delivered in the UK. Now we have closed the survey so we can download all the responses collected into a spreadsheet. Each response has a unique identifier so responses to each question by each individual can be tracked without being able to identify the person themselves. We will then ‘code’ the responses so the statistical package can perform the analysis. This simply means all the answer choices have a number assigned to them. For example, the answers to the question “What is your gender?” would be coded as 1 for male and 2 for female. We will use simple statistics such as means (the average value) and modes (the more frequent value); and frequency tables and cross-tabulations to present our results in the final report. For the free text responses we will be using qualitative analysis techniques to identify all the issues raised and will present these findings in a descriptive narrative. Many thanks again to all our respondents, your time is much appreciated and will form an important part of the findings of our project. Survey of healthcare professionals: one week left! Our survey of healthcare professionals (HCPs) who are involved in providing orthotic devices for knee instability in people with neuromuscular disease or central nervous system conditions is well underway. 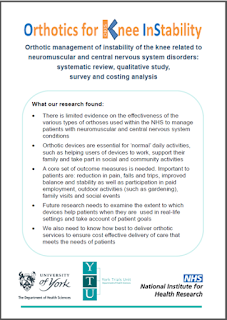 The aim of the survey is to identify the types of orthotic devices currently being used by the NHS in the management of instability of the knee related to neuromuscular and CNS conditions. We also want to find out about patient pathways after referral for an orthotic device and what healthcare professionals think are important outcomes for patients. We are investigating the use of orthotic devices for knee instability in adults. We are a team of researchers at the University of York and there are three elements to our project: a systematic review of existing evidence; a survey of health care professionals; and thirdly, interviews with people who have a neuromuscular disease and a knee orthotic device. This blog provides news of progress and insights into the processes from the researchers, health professionals and patients involved. University of York. Simple theme. Powered by Blogger.